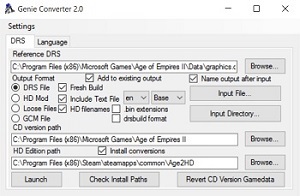 Genie Converter is a tool to convert between the various Age of Kings mod file formats that have developed over time, as well as installing mods. There are a range of advanced options, but it opens with a reduced interface suitable for installing AKX and GCM files. Its amazing how long this has gone unnoticed over the last couple of years. Genie Converter by Vardamir is a simple program that can be used to install AKX and GMC files. The simple program is a very useful tool for all modders, new and old. Especially those ones who have nostalgic memories of Mods from the past. In the past, most Mod Packs were made and installed with a popular program called Mod Pack Studio (MPS) a program that would turn Mods into an AKX file. These AKX files would then be used by MPS to install the Mod into the game. However due to the age of MPS it was only functional on 32 bit operating systems, and most modern operating systems now use a 64 bit OS. This means that Mod Pack Studio has not been used by modders for many years and has also meant that it has been incredibly difficult and time consuming for people to extract the SLPs from these AKX files and install older mod packs. This has been a shame since there are hundreds of lost relics in the depths of the Blacksmith that have not been used in years due to the lose of MPS. Genie Converter is a simple tool that can help fix this problem. With a few simple clicks this impressive program can extract the files from an AKX, rename them and add them to your existing gamedata_x1_p1.drs file, thus installing the old mod pack and adding it into your game. This tool saves you loads of time because you now no longer have to manually extract the akx file and manually rename ever file extension into an SLP. The program also uninstalls the mod with a simple button click too. Since I have found this tool I have used it to go down memory lane and install some old mod packs so as METC and Rome at War. The program is flawless, bug free, and very easy and simple to use. The user interface is user friendly and well layed out. The upload comes with a detailed and well written readme that has everything you need to know about the program, and detailed instructions on how to use it too. The program is designed to support both the CD and HD editions of Age of Empires and also has the ability to incorporate the Userpatch too. Overall I have found no flaws with the program and I believe it to be one of the best programs for modders since Turtle Pack and AGE, if not the best. Overall this simple to use and flawless program is a must for anyone who would like to take a trip down the dusty halls of the AOKH blacksmith and take a look at some of the old classics that lay on the shelves. Thank You Vardamir for this incredible tool!